South Beach is, internationally, the most well known part of South Florida. It is a magnet for athletes, movie stars, and international wealth. It is also one of the richest commercial areas on the beach. Much loved for its great weather and unforgettable beaches, Miami Beach as a whole is visited year-round, regardless of the season. One can never be bored when visiting The Beach, as there is something for everyone. If you are looking for a quiet and more mature scene, North Miami Beach provides a peaceful atmosphere. Attractions of North Miami Beach include Miami-Dade County’s Haulover Park/Beach, a popular clothing-optional beach, and the St. Bernard de Clairvaux Church. be. The Church is an authentic Medieval Spanish monastery made of stone and is a tourist attraction as well as a popular location for weddings. Miami Beach, especially Ocean Drive, houses the Art Deco District, which is oftentimes featured in popular films and television shows. The New World Symphony Orchestra is also based in The Beach. The Symphony is the only full-time orchestral academy in the United States that prepares musicians for careers in symphony orchestras. 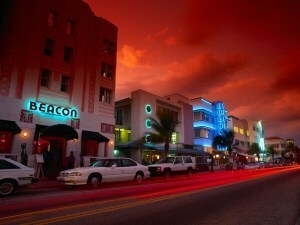 Lincoln Road, a very popular spot on the beach, stretches east to west, between 16th and 17thstreets. Known for shopping, outdoor dining, rollerblading, cycling, and even people watching, Lincoln Road is also comprised of a diverse array of galleries containing work from renowned artists, photographers, and designers. Other places of interest in Miami Beach include the Jackie Gleason Theatre, Fontainebleau Hotel, the Eden Roc, the Holocaust Memorial, the Versace Mansion (Casa Casuarina), and Miami Beach’s Architectural District.